Students gather around as Dean Austin Quigley holds court for a final Senior Dinner. It seemed less like a farewell meal and more like the final concert of a beloved rock star. Before they had finished their second glass of wine under a tent on South Lawn, the raucous Class of 2009 was cheering for Dean Austin Quigley at what was his Senior Dinner as well as theirs. 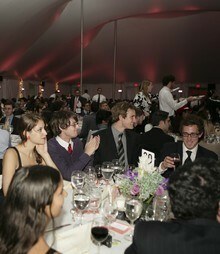 Seniors enjoyed a formal dinner and wine under a tent on South Lawn on May 4. Quigley, who is stepping down after 14 years as Dean of the College, poked fun at the class and delivered a stand-up routine that had them roaring before closing with praise for the school and his final senior class. Columbia College Alumni Association former president Gerald Sherwin ’55 (left), Quigley and Columbia College Fund chair Mark Amsterdam ’66 enjoy the Senior Dinner. PHOTOS: CHAR SMULLYANApproximately 900 seniors gathered for the semi-formal dinner on May 4, the last day of classes. 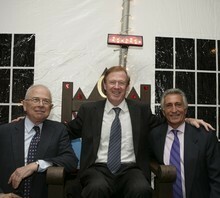 The dinner is an annual tradition that is one of the highlights of the graduation season. At the event, which was sponsored by the Alumni Office, Kristin Kramer ’09, Senior Fund chair, announced that the Senior Fund Gift Committee had received gifts from 90.5 percent of the class, beating all other Ivies and crushing the Class of 2008 record of 85 percent.